I’ve been in Bristol for almost 10 years now, and I don’t really miss London at all. One thing that I did love, though, was the fact that in the area where I lived, I could head out at the weekend and get my meat from the local butcher, my bread from the local baker, and my fruit and veg from the local greengrocer. It’s not just about supporting local small businesses (although that’s important, obviously) – it’s also about the quality of the produce that you’re buying. And it’s lovely that I’m able to do the same in Bristol too: living on the harbourside, it’s a short walk down to East Street and North Street (not forgetting Wapping Wharf too) where there are plenty of indies to choose from. 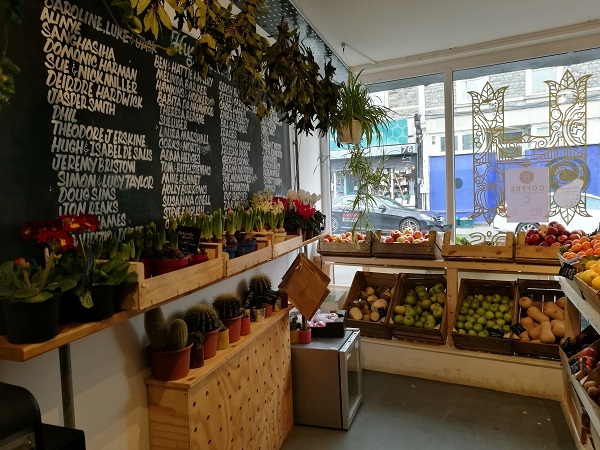 One of those independent businesses is Hugo’s Greengrocer, which opened in early 2018. Owner Hugo Sapsed raised over £5,000 via a crowdfunding campaign to pay for the initial run of stock, which primarily comes from farmers within a 15-mile radius of the city. And the shop itself is beautiful. From the Bristol-inspired “H” logo on the window to the displays of fruit, veg and plants inside, it’s a real feast for the eyes. 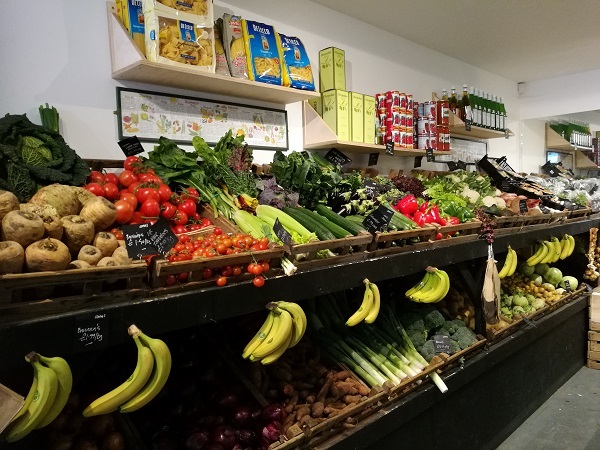 Towards the rear of the shop, there’s plenty more seasonal fruit and veg along with some storecupboard staples – plus a chiller cabinet with fresh locally made pasta, cheese and more. There’s even a coffee machine should you want to grab a brew to go. Hugo himself is generally around too, to offer advice on your purchases – and he certainly knows his stuff. It’s clear that he’s seriously passionate about local produce, too, which is lovely. I’ve been in a few times to buy fruit and veg, and I’ve always been impressed with the quality and the variety. 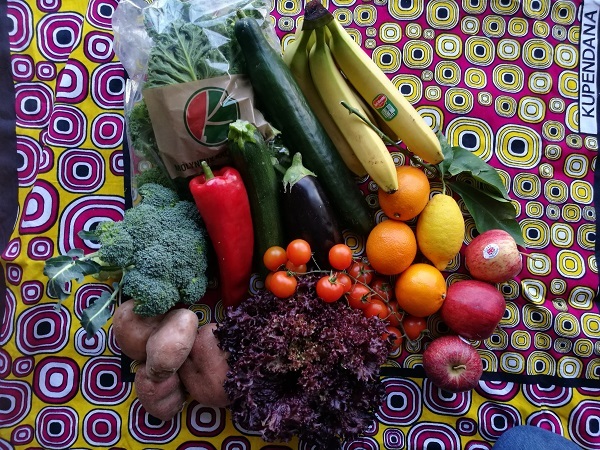 But it’s not just about the shop – Hugo’s Greengrocer also offers a fruit and veg box delivery scheme, with free local delivery. Boxes vary in price – from around £10 upwards – and when you place your first order, you’re given a form to fill in that not only asks for contact details, but also for the amount you’re looking to spend, whether there are certain things you definitely do or don’t want included, and whether you’re after any extras, like bread, eggs and other local produce. So we decided to give it a go. We went for the £15 option, decided we definitely wanted potatoes and bananas (the little one’s obsessed with them!) and left the rest of the contents to Hugo to decide. Date of delivery chosen, we waited – and it arrived dead on time. And it all looked beautiful: the promised bananas and potatoes were in there, along with a head of lettuce, another of broccoli, cherry tomatoes, kale, courgette, cucumber, a lemon, apples, blood oranges, an aubergine and a red pepper. There’s no denying the quality of it all – and in terms of shelf life, it lasted a while. 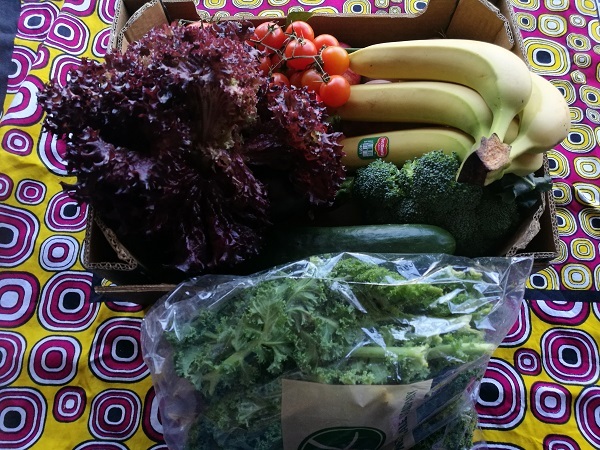 Considering it was all relatively “standard” fruit and veg, though, the pricing seemed a little high, and we still had to top up during the week. I know there’s no real comparison, but with the East Street Fruit Market just down the road doing an ENORMOUS fruit and veg box for a tenner, Hugo’s Greengrocer has its work cut out to compete in the veg box market. In terms of the shop itself, though, I definitely recommend a visit for great produce, beautifully displayed and sold with passion.